Alibaba Cloud PrivateZone is a Virtual Private Cloud-based (VPC) domain name system (DNS) service for Alibaba Cloud users. You can use PrivateZone to quickly build a DNS in one or more specified VPCs and resolve private domain names to IP addresses. Private domains can only be accessed in associated VPCs based on Alibaba Cloud's unique VPC tunnel IDs. 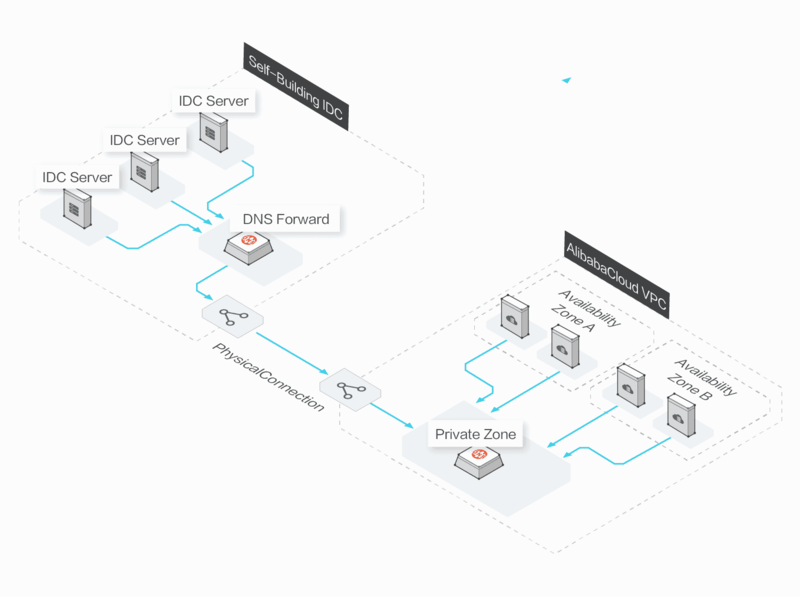 You can use PrivateZone to change configurations quickly because the VPC-based DNS resolver returns the IP address immediately with no needs for recursive DNS queries. You can add existing domain names and subdomain names on the Internet and custom domain names to PrivateZone. PrivateZone supports reverse lookup that resolves IP addresses to domain names. PrivateZone isolates private zone data in different VPCs. Private domains can only be accessed in associated VPCs based on the tunneling feature of Alibaba Cloud VPC because each VPC has a unique tunnel ID. You can share private domain name records in the hybrid cloud by connecting private data centers with specified VPCs through a dedicated network connection. You can use PrivateZone to manage your private domain names in internal networks. PrivateZone supports generic top-level domains (TLD) approved by ICANN and user-defined TLDs. In PrivateZone, domains are hosted in private zones. Zone files are compatible with Bind 9. PrivateZone supports reverse lookup which resolves private IP addresses to domain names. You can use PrivateZone to create a PTR record for your private IP address and obtain the exact corresponding hostname information. You can use PrivateZone to configure internal domain name lookups in the hybrid cloud. You can connect an Alibaba Cloud VPC in a hybrid cloud scenario with on-premises data centers through a dedicated network connection. You can forward DNS requests from on-premises data centers to PrivateZone to make it easier to manage your DNS and ensure consistency in the DNS data. You can call operations in the hybrid cloud by using PrivateZone. You can use PrivateZone to resolve a server hostname to IP address. PrivateZone provides DNS service for all your private domains in the internal networks. Deploy your project to Alibaba Cloud in ten minutes. Operating systems, software, and images provided by third-party developers.